The Mutin is one of the last four sailing ships of the French Navy. She served in the region of St-Malo to the pilotage school in St-Servan which closed its doors in 1965. She is a traditional ship to the image of tuna Dundee. She is equipped with an auxiliary motor of 120 hp and has a wing of 240 sqm. The Mutin was commissioned in 1926 by the Direction des Constructions Navales of Brest. She was intended to the pilotage school of St-Servan near St-Malo. Her career starts in Saint-Servan where she is used to train Navy pilots. She sails very close to shore to teach drivers bitter, currents, alignments ... The school of St-Servan closes its doors in 1939 at the declaration of war, and Mutin joined Brest. She participates in the evacuation of soldiers and sailors and then joined England. In October 1940, Mutin was requisitioned by the SOE (Special Operations Executive) responsible for the infiltration of intelligence officers. She then receives a steering wheel to replace its tiller and a new engine of 150 hp. She participates in several secret missions in the English Channel, then joined the Mediterranean where she will do the rest of the war. Returned to France in 1945, Mutin comes back to the pilotage school in St-Servan which has just reopened its doors in 1946. Each year, Mutin participates in February to forgiveness of Newfoundland fishing ships in St-Malo. 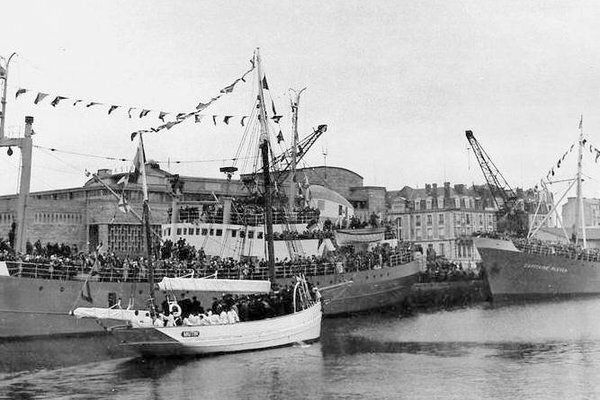 She shall take on board local authorities and archivèque of Rennes making the blessings of cod fishing ships of St-Malo, meeting in the basins before their departure for Newfoundland. In 1965, the pilotage school of St-Servan closes its doors and the Mutin joined Brest which became her home port. She is assigned to the Ecole Navale in 1968.